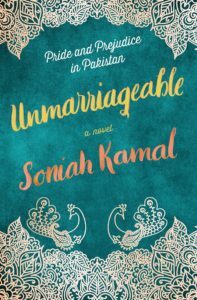 Unmarriageable is a unique and fresh take on Pride and Prejudice set in modern day Pakistan. When an invitation arrives to the biggest wedding their small town has seen in years, Mrs. Binat, certain that their luck is about to change, excitedly sets to work preparing her daughters to fish for rich, eligible bachelors. On the first night of the festivities, Alys’s lovely older sister, Jena, catches the eye of Fahad “Bungles” Bingla, the wildly successful—and single—entrepreneur. But Bungles’s friend Valentine Darsee is clearly unimpressed by the Binat family. Alys accidentally overhears his unflattering assessment of her and quickly dismisses him and his snobbish ways. As the days of lavish wedding parties unfold, the Binats wait breathlessly to see if Jena will land a proposal—and Alys begins to realize that Darsee’s brusque manner may be hiding a very different man from the one she saw at first glance. I really enjoyed Unmarriageable. It updated the classic, Pride and Prejudice, not only in setting, but also culture. By having this classic story set in modern day Pakistan Unmarriageable adds new depth to the story. Not only do is Unmarriageable more expansive than I remember Pride and Prejudice, but it also adds another layer of meaning. Especially as our main character, Alys is considered to be in danger of never finding a husband – as she is an unmarried English teacher above 30. What I really loved about Alys’ character is that because she is an English teacher the reader is able to observe how the times have changed. Whether it be her mother, or her generation’s beliefs, versus the students. This was my favorite element of the entire book – the updating and occupation of Alys. If you like the classic, or just like a book set in modern day Pakistan about family, second chances, and love, then this is for you. Find Unmarriageable on Goodreads, Amazon, Indiebound & The Book Depository. Do you have a favorite Pride and Prejudice retelling? I feel like I have been seeing more and more of these lately! The summary alone has piqued my interest in reading this book. I’ve only seen Pride & Prejudice as a movie (will get around to reading it). And, I fell in love with the story because the main character didn’t suffer from instalove which common in that time period. Great review! Yeah, if you pick it up I hope you enjoy it!